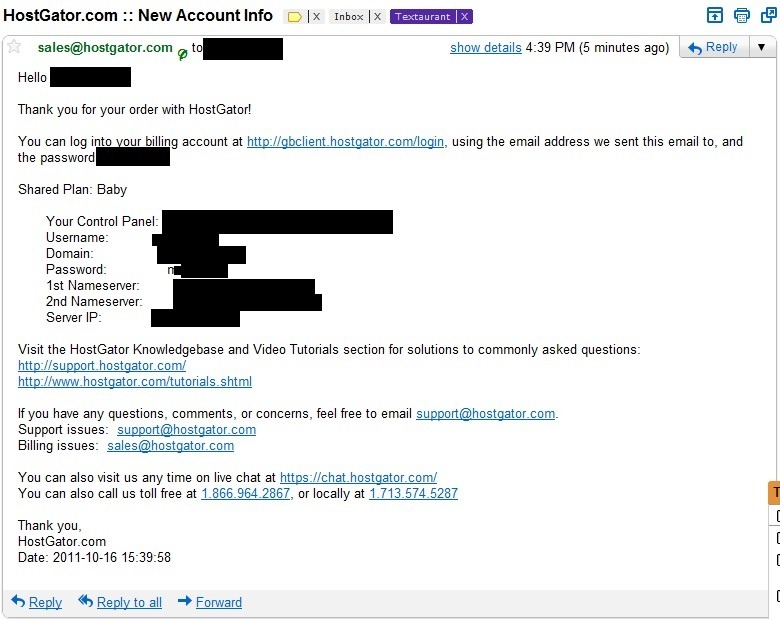 Is HostGator storing my password in plaintext? 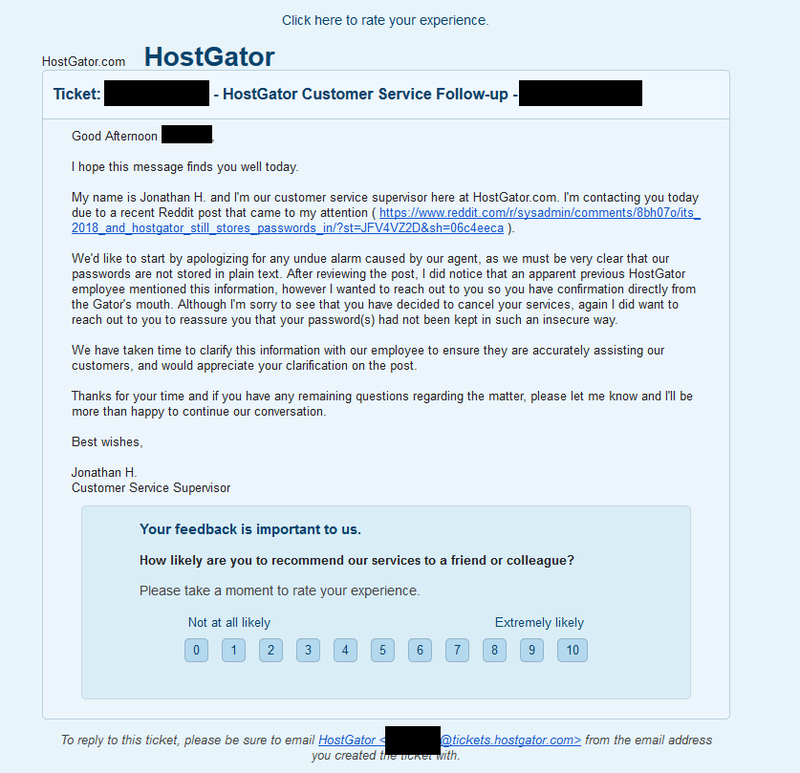 I want to bring this up to HostGator, but want to verify my suspicions before making a big fuss. I immediately brought this up to the representative, who repeatedly tried to convince me that it was OK. I decided to drop it after a few minutes, because I think I should bring it up to someone higher up. Before I do so, is it safe to assume that my password is stored in their database as plain text? If so, do you have any suggestions on how to address this issue with the provider? Yep, that's a big problem, especially if that was your old password (i.e. not a newly assigned one). Technically, the password might be stored under reversible encryption rather than plain text, but that's nearly as bad. The absolute minimum standard should be a salted hash - anything less and anybody with access to the auth database who wants to can use an online rainbow table to get back the plaintext passwords in moments - but single-iteration secure hash algorithm (SHA) functions are still easy to brute force with a GPU (they're designed to be fast; a high-end GPU can compute billions per second) so they really ought to be using a proper password hashing function such as scrypt or argon2, or in a pinch bcrypt or PBKDF2. Also, there is absolutely no way to guarantee that the email was encrypted along the entire path between their mail server and your email client. Email was designed in a day when people didn't really consider such things to be critical, and short of an end-to-end encryption scheme like OpenPGP or S/MIME, email is at best encrypted opportunistically, and may be passed through an unencrypted relay. Yes, they store passwords in plaintext or equivalent, and definitely transmit them in plain text. This was discovered in 2011. If the company rep's response is true, the Password is stored as an encrypted text. This makes the plain text password in unprompted email a bigger concern. is it safe to assume that my password is stored in their database as plain text? The company representative explicitly told that they are not storing the password in plain text. Assuming that he is telling the truth, my conclusion is that they are storing the password in encrypted text. They are better than plain text passwords but they are still insecure. Hashing and salting is the best way to store passwords. If the stored password is encrypted, the biggest concern here is not the way it is stored but the way it is transmitted, in plain text on an email when the user did not request any. do you have any suggestions on how to address this issue with the provider? Stop sending passwords over email. Provide Reset password option instead of recovering it. Replace encrypting passwords with Hashing and Salting. Yes, there is high chance that the rep is lying or didn't know what he is talking about. But there is also a possibility that he was telling the truth. This answer deals with that scenario. 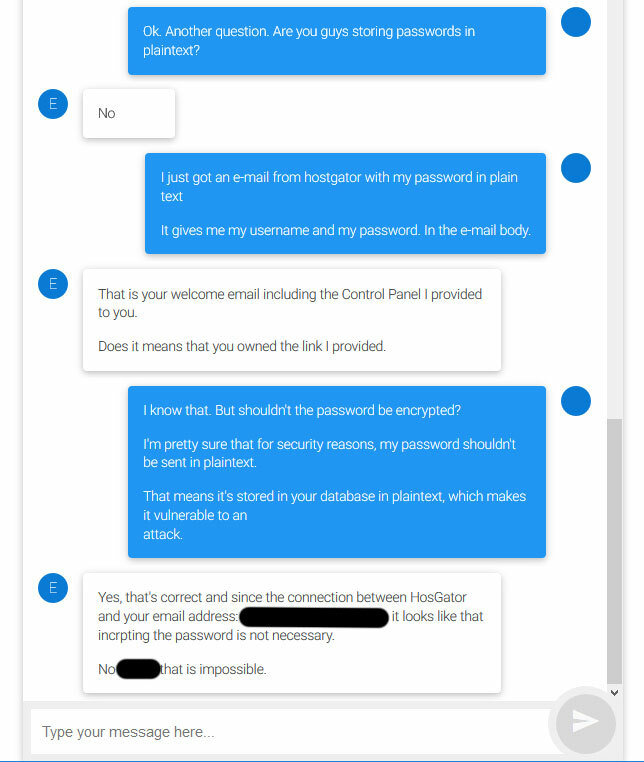 I consider transmission of passwords as a bigger problem to storage because the OP was sent the password in an email when he did not ask for any. I have seen systems that store passwords in an encrypted text and send them to users upon request. They are not secure, but they do exist. Just because you received your info in plain text does not guarantee it is stored that way too. Not the answer you're looking for? Browse other questions tagged passwords databases web-hosting or ask your own question. How up-to-date is the plaintextoffenders list? Is it better to hash n*x times in sha1 or n times in sha512 on the client side? Received an email about an “Etsy” Password Reset due to the “Linkedin Breach…” is this a phishing attempt? Third party program is storing a password in a DSN. Is it a security threat?